Ian Wigby is about to find out that he is a very special boy. I loved this book (well I like anything that’s young adult and has to do with ancient Greek, Roman, or Egypt myths or history), but anyway this book is amazing. There are three books. 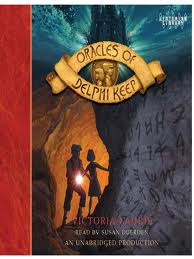 I want to share this book with you it has evil sorcerers, oracles, friendship, magic, and prophecies. This is a book that is great for trips (as long as you bring the second and third book as well). I read this book in one day I got it from my local library and read it. I couldn’t put it down until I found out what happened then I grabbed the second book and started reading it to. It is great if you need a book to read. Also it is an AR book for those who need to read those books for school. So, all I’m saying is you should read this book.